Bark adnate, developing furrows and ridges or peeling in small strips; leaves compound, with 7 leaflets, often with a reddish central stem; nut shells thin; growing east of the Great Plains. Habitat: Primarily in upland woods; growing east of the Great Plains. 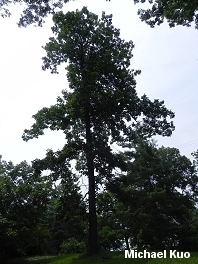 Stature: 50x-80 feet high; to 3 feet in diameter; with an oblong or rounded crown. 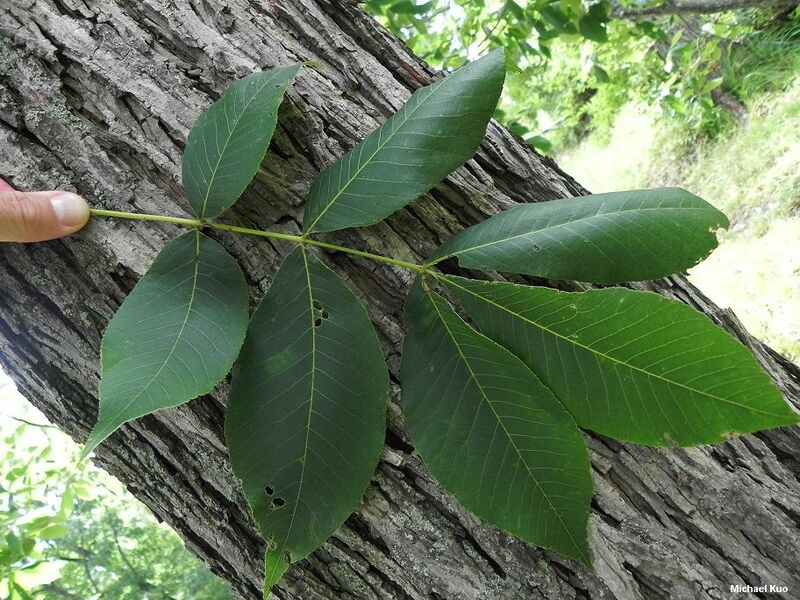 Leaves: Compound; composed of 7 (occasionally 5) leaflets; central leaf stem often reddish; leaflets candle-flame-shaped, finely toothed, with the end leaflets up to 6 inches long; green and smooth on top, finely hairy below. 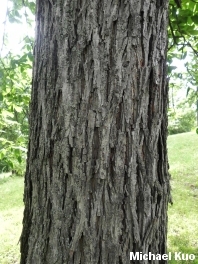 Bark: Gray, sometimes with reddish hues; adnate and furrowed when young; developing furrows and criss-crossed ridges; sometimes breaking up into small strips that pull away from the tree with maturity, or sometimes remaining more or less adnate. Nuts: 1/2 - 1 1/4 inches long; nut shell thin; nut sweet. Some taxonomists consider red hickory and pignut hickory to represent the same, variable species. Auricularia auricula; Cortinarius distans; Russula species; and others.